Delicious shelf-stable olives from small family farms in Sicily, Greece, and Spain are now available through Jeff’s Naturals – a California-based company specializing in jarred Mediterranean products free of preservatives, stabilizers, artificial colors, flavors and sulfites. 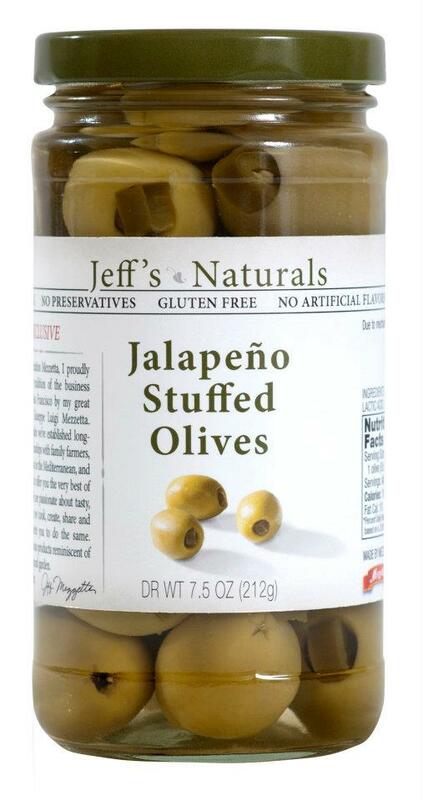 With seven types of jarred olives in the company’s product line, Jeff’s Naturals appeals to a wide variety of those who love their olives plain, stuffed, or sliced. Jeff’s Naturals Whole Castelvetrano Olives are imported from olive farms in Castelvetrano, Sicily. With a natural buttery and nutty flavor, these meaty olives have a beautiful natural green color and make a perfect hors d’ oeuvre. Keep a few jars in the cabinet for a truly exceptional snack option. Non-GMO verified, gluten-free, and vegan certified. Whole Pitted Kalamata and Sliced Greek Kalamata Olives are sourced from family farms in Greece where the almond-shaped aubergine colored olive is widely grown. Often referred to as a Greek Olive, the Kalamata Olives are marinated in organic distilled and red wine vinegar, salt and water to preserve their rich flavor. Certified organic, non-GMO verified, gluten-free, and vegan. Jeff’s Naturals makes four types of stuffed olives: Garlic, Jalapeno, Feta, and Blue Cheese. The Garlic and Jalapeno Stuffed Olives are colossal sized olives hand stuffed with locally source garlic from Gilroy, California (the garlic capital of the US) or jalapeno peppers from central California family farms. Both are certified non-GMO verified, gluten-free, and vegan. The cheese stuffed olives are large Spanish olives stuffed with either Feta or Danish Blue Cheese. Ideal for antipasto platters as an hors d’oeuvre, the stuffed olives can also be sliced and tossed into a salads or included in any dish that calls for bold flavored olives. Certified gluten-free. Now, do as the company suggests: “crack open a jar and get inspired.” Olives by Jeff’s Naturals are available nationwide at grocery stores and on-line through www.vitacost.com for about $6 for a 12-ounce jar.